Police reports say that more victims have come forward claiming fake doctor Oneal Ron Morris from Florida injected toxic substances into their buttocks. Oneal Ron Morris, a 30-year-old woman transgender, was arrested for practicing medicine without a licence with serious bodily injury after a patient complained he pumped cement and “Fix-a-Flat” tire sealant into her backside. The treatment left the victim with life threatening injuries and she needed several surgeries and round-the-clock care. Police say Oneal Ron Morris is a man but appears to be a woman and her arrest photographs show an apparently enhanced rear. Detectives say she performed the potentially lethal treatment on herself. Jennifer Hirst, deputy press secretary of the Florida Department of Health told NBC in Miami that other possible victims have come forward as a result of the media attention. The victims are claiming Oneal Ron Morris performed similar procedures on them and that they suffered severe complications. Jennifer Hirst said additional arrests in the case are possible. She didn’t offer any more details about the new victims. Oneal Ron Morris is now free on bond but he probe by the Miami Gardens Police and health officials is continuing. According to the arrest report, the patient went to Oneal Ron Morris’s home and paid $700 for six injections “in each buttock to improve its shape and cosmetic” appearance. 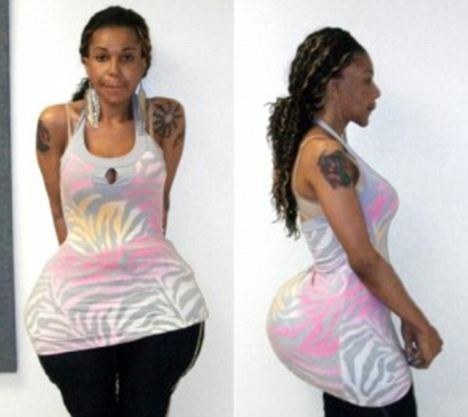 She allegedly used superglue to seal the incisions. Within hours, the victim began to feel sick and eventually required treatment at several hospitals.